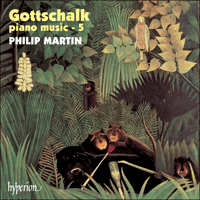 This is the fifth disc in our ongoing Gottschalk series and the success of the project means that what we originally expected to be a few highlights discs seems likely to become the first complete recording of the composer's output for solo piano. We are now well past the half-way point and another 2-3 CDs should encompass the project. All Gottschalk's usual hallmarks are here—Caribbean rhythms, tear-jerking melodies, salon polkas, national melodies—wrapped up in the most elegant 19th-century virtuoso pianism. The repertoire includes several of the composer's best known pieces such as the hugely virtuosic 'Tremolo' (the last piece Gottschalk ever played as he collapsed during a performance of it and died shortly after of a ruptured appendix) or the Cuban inspired 'El Cocoyé', all played in his usual idiomatic style by Philip Martin, by critical consent the foremost exponent of Gottschalk playing today. For a start, how do you pronounce his name? Does the last syllable rhyme with ‘fork’ or ‘talc’? (Comforting to know that his public had the same difficulty; in 1848 the readers of La France Musicale were advised: ‘Close the lips, advance the tongue, appear a little like whistling, and you will have the solution.’) Dates? 1829–1869. Instrument? The piano. Compositions? Mainly short keyboard works (well over a hundred are extant—an almost equal number have been lost), with excursions into opera and orchestral works. Genre? Patriotic fantasies, operatic transcriptions, salon morceaux and, most importantly, the first examples of Creole, Latin-American and Afro-American dance rhythms used in European musical forms. These brief prophetic works—anticipating ragtime by more than half a century and the works of Albéniz,Granados and Milhaud (amongst others)—made Gottschalk the first truly American composer. His background was exotic. Born a Creole in New Orleans in 1829, he was the oldest of seven children. Moreau (as he was known in the family) was named after his great-uncle Count Moreau de l’Islet. His maternal great-grandfather, Count Antoine de Bruslé, had been a cavalry commander under Louis XV and appointed Governor of Santo Domingo. The family had fled from Haiti to Louisiana because of the slave rebellion of the 1790s. His mother, Marie-Aimée de Bruslé, enjoyed the comfortable life of the upper classes of New Orleans. His father, Edward Gottschalk, was of Jewish extraction, born in London and educated in Germany. His love of travel led him to New Orleans where he established a successful brokerage business. Moreau absorbed the local music like a sponge, for it was apparent from the age of three, when he began to play the piano, that he was a musical prodigy. His first lessons were with François Letellier, organist and choirmaster of St Louis Cathedral, for whom he was skilled enough to deputize by the age of seven. On the advice of Letellier, the Gottschalks dispatched their twelve-year-old son half way round the world to study at the centre of the musical world, Paris—no mean adventure 150 years ago. Incorporating as they did snatches of folk tunes and half-remembered ballads from his childhood, these four compositions were the first attempts by a classically- (i.e. European-) trained composer and pianist to utilize the native musical elements of the Americas. When they were first heard in public, Gottschalk was still in his teens and we can imagine the stir they must have created amongst an audience fed on a pianistic diet of sonatas, studies and opera pot-pourris. Hearing this quartet of Louisiana pieces, it is hard to believe that they are more or less contemporaneous with Chopin’s Barcarolle Op 60 and Waltzes Op 64, Schumann’s Piano Trios and Liszt’s Consolations and Liebesträumen. The strutting Danses créoles of Gottschalk are light worlds away and no other composer made use of this particular world again until Scott Joplin’s Maple Leaf Rag was published in 1899. After Paris, Moreau set out to conquer the rest of Europe which he did with spectacular success. He toured Switzerland and the French provinces in 1851, later that year trying his luck in Spain. Here he became the favourite of Queen Isabella II (who awarded him the Cross of Isabella the Catholic, one of several decorations which Gottschalk had the endearing habit of wearing for important recitals). In January 1853 he returned to the United States a celebrity. His acclaim as a pianist and composer had gone before him, and his success with women—he never married—did nothing to reduce his popularity. His friend the Manchester-born pianist and composer Richard Hoffman wrote: ‘His eyes were the striking features of his face, large and dark with peculiarly drooping lids, which always appeared half closed when he played. There must be some youthful grandmothers in New York today  who have experienced the charm of their magnetic albeit languorous glances.’ Gottschalk used to complain that the young girls who flocked to his concerts distracted him and made him hit wrong notes! What sort of a pianist was he? By all accounts he was one of those natural players who never needed to practise much and who, incidentally, never had another lesson after he bade farewell to Stamaty at the age of seventeen. His speciality was brilliant rapid flights in the upper reaches of the treble with a love of repeated-note figurations, set against crisp, clear execution and a rhythmic, driving vitality. Much of his music is by no means easy to play and is frequently physically taxing. It requires an impeccable technique, a fleet, delicate touch matched with élan, charme and joie de vivre for its most effective execution. Gottschalk’s life in America was one of constant touring, from Cuba to Canada to California. 1857 to 1862 (a period of his life about which comparatively little is known) he spent largely in South America, including the Antilles, Haiti, Puerto Rico, Jamaica, Venezuela, Martinique and Guadeloupe. (What, one wonders, were the pianos like in these places?) On this last island, living on the slopes of Mount Matouba, he lived the life of a semi-recluse with his only companion, ‘a poor lunatic whom I had met on a small island, and who had attached himself to me … my friend, whose insanity was of a mild and harmless character, fancied himself the greatest genius in the world. He was, moreover, under the impression that he suffered from a gigantic, monstrous tooth.’ This and many more compelling details are revealed in Gottschalk’s diary Notes of a Pianist, which, with those of his friend Berlioz, are quite the most fascinating musicians’ journals of the nineteenth century. He did not return to New York until 1862 from whence he embarked on another series of recitals, a hectic schedule which he maintained for nearly three and a half years, throughout the run of the Civil War. When he arrived in San Francisco in May 1865, the Daily Alta California calculated (with the pianist’s help) that thus far he had travelled 95,000 miles on the railway and given 1100 concerts in the process. Our hero was forced to leave California, however, more hurriedly than he would have cared to. His womanizing on this occasion led to a vilification in the newspapers, a story which today’s tabloids would have lapped up: ‘Gottschalk Seduces Young Lady From Oakland Female Seminary’, the headlines would have roared. ‘Vagabond musician … should suffer death …’ was what was actually printed. Gottschalk left for South America by boat and, though his name was cleared eventually, never again returned to the United States. The last three years of his life are chronicled intermittently. He seems to have lived mainly in Peru, Chile and Uruguay where, in February 1868, he gave sixteen concerts in Montevideo alone. He arrived in Rio de Janeiro in May 1869. Six months later he collapsed during a recital while playing his composition Morte!!. He died in December of empyema, the result of a ruptured abscess in the abdomen. He was forty years old. His remains were returned to the USA and buried in Greenwood Cemetery, Brooklyn. It is too easy to dismiss the likes of Louis Moreau Gottschalk as second division figures of somewhat dated fun. Gottschalk was not a Great Composer. That is obvious to anyone. He himself had no aspirations to that Olympian height. He was a crowd pleaser and a very successful one. At its best, the music is intensely individual and comes off the page white hot. It has the spontaneity and immediacy of improvisation allied, with intoxicating effect, to disciplined European pianism. Gottschalk was the equivalent of one of today’s pop stars and brought to the widest public attention (did any artist before Paderewski travel so widely in America?) the syncopated rhythms of his country’s music. That promulgation was, in itself, a monumental achievement, for it paved the way for a whole wave of music that could, for the first time—thanks to Gottschalk—be called uniquely American. D’abord, comment prononcez-vous son nom? Doit-il rimer avec talc ou avec rauque? (Il est rassurant de savoir que son public avait les mêmes difficultés; en 1848 les lecteurs de La France Musicale recevaient les conseils suivants: «Fermez les lèvres, avancez la langue, faites un peu comme si vous siffliez, et vous aurez la solution»). Les dates? 1829–1869. L’instrument? Le piano. Les compositions? Surtout de courtes œuvres pour clavier (plus de cent sont encore en existence—presque autant ont disparu), avec des incursions dans des œuvres orchestrales et opératiques. Le genre? Des fantaisies patriotiques, des transcriptions opératiques, des morceaux de salon et, les plus importants—les premiers exemples de rythmes de danse créoles, afro-américains et latino-américains utilisés dans des formes musicales européennes. Ce sont ces brèves œuvres prophétiques, qui, en anticipant le ragtime de plus de cinquante ans ainsi que les œuvres d’Albéniz, Granados et Milhaud (entre autres) font de Gottschalk le premier compositeur vraiment américain. Ses antécédents sont exotiques. Il était créole, né à La Nouvelle-Orléans en 1829, l’aîné de sept enfants. Moreau (c’est ainsi que sa famille l’appelait) avait reçu le nom de son grand-oncle le Comte Moreau de l’Islet. Son grand-père maternel, le comte Antoine de Bruslé, avait été un commandant de cavalerie sous Louis XV et nommé gouverneur de Saint-Domingue. À la révolte des esclaves des années 1790, la famille avait fui Haiti et s’était réfugiée en Louisiane. Sa mère, Marie-Aimée de Bruslé, vivait la vie confortable des aristocrates de la Nouvelle-Orléans. Son père, Edouard Gottschalk, était d’origine juive, né à Londres et avait fait ses études en Allemagne. Son amour des voyages le mena à La Nouvelle-Orléans où il fonda une affaire de courtage prospère. Moreau absorbait la musique locale comme une éponge, car il devint manifeste quand il eut trois ans et commença à jouer du piano, qu’il était un prodige musical. Ses premières leçons lui furent données par François Letellier, organiste et chef de chœur de la cathédrale Saint Louis; et à sept ans il était déjà capable de le remplacer. Sur les conseils de Letellier, les Gottschalk envoyèrent leur fils, âgé de douze ans, presque de l’autre côté du monde, étudier dans le centre du monde musical—Paris—une grande aventure, il y a 150 ans. Ces quatre compositions, qui incorporent des fragments d’airs folkloriques et des ballades à demi-oubliées de son enfance, sont les premières tentatives par un pianiste et compositeur de formation classique (c’est-à-dire européenne) d’utiliser les éléments musicaux originaires des Amériques. Quand le public les entendit pour la première fois, Gottschalk n’avait pas encore vingt ans, et l’on peut imaginer la sensation qu’elles durent représenter pour une audience nourrie d’un régime de piano basé sur des sonates, études et pot-pourris d’opéra. En écoutant ce quatuor de pièces de la Louisiane, il nous est difficile de réaliser qu’elles sont contemporaines de la Barcarolle op. 60 et des Valses op. 64 de Chopin, des Trios pour piano de Schumann et des Consolations et Liebesträumen de Liszt. Les fières Danses créoles de Gottschalk font partie d’un autre monde et il faudra attendre Scott Joplin et la publication en 1899 de son Maple Leaf Rag pour qu’un autre compositeur utilise ce monde. Après Paris, Moreau partit à la conquête du reste de l’Europe, ce qu’il fit avec un succès spectaculaire. Il fit des tournées en Suisse et dans les provinces françaises en 1851, et tenta sa chance en Espagne ensuite, la même année. Là il devint le favori de la Reine Isabelle II (qui lui décerna la Croix d’Isabelle la Catholique, une des nombreuses décorations que Gottschalk avait l’habitude sympathique de porter pour des récitals importants). En janvier 1853, il retourna aux Etats-Unis sa célébrité assurée. Sa réputation de pianiste et de compositeur l’avait devancé, et ses succès auprès des femmes—il ne se maria jamais—ne nuisait en rien à cette réputation. Son ami, Richard Hoffman, pianiste et compositeur originaire de Manchester, écrivit: «Les traits frappants de son visage étaient ses yeux, grands, sombres aux paupières curieusement tombantes, et qui paraissaient toujours à demi-clos quand il jouait. Il doit y avoir un certain nombre de jeunes grand-mères à New York, aujourd’hui , qui ont subi le charme de leur regard magnétique tout en étant langoureux». Gottschalk se plaignait que les jeunes filles qui se pressaient à ses concerts le distrayaient et lui faisaient jouer de fausses notes! Quelle sorte de pianiste était-il? Au dire de tous, c’était un de ces interprètes naturels qui n’avait jamais besoin de beaucoup travailler au piano et qui, soit dit en passant, n’eut jamais d’autre leçon après qu’il eut quitté Stamaty à dix-sept ans. Sa spécialité était de rapides et brillants envois dans les plus hautes notes soprano, avec une prédilection pour des traits à répétitions de notes, opposés à une exécution claire, précise et une vitalité rythmique à la force battante. La plus grande partie de sa musique est plutôt difficile à jouer et est fréquemment éprouvante physiquement. Elle demande une technique impeccable, une touche rapide et délicate alliée à un élan, une joie de vivre et un charme pour que son interprétation soit parfaite. La vie de Gottschalk aux Etats-Unis n’était faite que de tournées, de Cuba au Canada en passant par la Californie. De 1857 à 1862 (période de sa vie sur laquelle nous avons relativement peu de renseignements), il vécut en grande partie en Amérique Latine—aux Antilles, à Haïti, à Porto Rico, à la Jamaïque, au Venézuela, à la Martinique et à la Guadeloupe. (On peut se demander quelle sorte de pianos il trouvait dans ces endroits-là.) En Guadeloupe, sur les flancs du Mont Matouba, il mena une vie à demi-recluse, avec pour toute compagnie «un pauvre fou que j’avais rencontré sur une petite île et qui s’était attaché à moi … mon ami, dont la folie était bénigne et inoffensive, se croyait le plus grand génie de la terre. Il pensait aussi souffrir d’une dent gigantesque et monstrueuse». Nous trouvons ces détails avec bien d’autres tout aussi irrésistibles dans le journal de Gottschalk Notes d’un Pianiste qui est, avec celui de son ami Berlioz, le plus fascinant des journaux de musiciens du dix-neuvième siècle. Il ne revint à New York qu’en 1862 d’où il repartit pour une autre série de récitals, un programme fou qu’il continua pendant trois ans et demi, pendant toute la Guerre de Sécession. Quand il arriva à San Francisco en mai 1865, le Daily Alta California calcula—avec l’aide du pianiste—que jusque là il avait voyagé 95,000 miles en chemin de fer et donné 1100 concerts au cours de ces voyages. Il faut cependant ajouter que notre héros dut quitter la Californie beaucoup plus vite qu’il ne l’aurait souhaité. Ses habitudes de bonnes fortunes avec les femmes aboutirent cette fois-là à des diffamations dans les journaux, une histoire qui ferait la joie d’une certaine presse de nos jours: «Gottschalk séduit une jeune fille du séminaire féminin de Oakland», diraient-ils en grands titres. Ce qui fut en fait imprimé fut: «Musicien vagabond … devrait être mis à mort …» Gottschalk partit pour l’Amérique du Sud en bateau et, bien qu’il ait été innocenté finalement, il ne retourna jamais aux Etats-Unis. Nous n’avons que des renseignements intermittents sur les trois dernières années de sa vie. Il semble avoir vécu principalement au Pérou, au Chili et en Uruguay, où en février 1868, il donna seize concerts à Montévidéo. Il arriva à Rio de Janeiro en mai 1869. Six mois plus tard il s’écroula durant un récital alors qu’il interprétait sa composition Morte!!. Il mourut en décembre d’empyème, résultat d’un abcès perforé dans l’abdomen. Il avait quarante ans. Ses restes furent retournés aux Etats-Unis et enterrés au cimetière de Greenwood à Brooklyn. Amy Fay écrivit dans ses charmantes lettres adressées à sa famille, publiées sous le titre d’ Études Musicales en Allemagne: «Je suis terriblement navrée d’apprendre la mort de ce pauvre Gottschalk. C’était un pianiste merveilleux que nul ne surpassait, je crois … envoyez moi tout ce qui paraîtra sur lui dans les journaux, car l’engouement que j’ai ressenti pour lui avec 99,999 autres jeunes Américaines dure toujours dans mon cœur». Il est trop facile de rejeter les artistes comme Louis Moreau Gottschalk comme des personnages de seconde division d’un amusement plutôt démodé. Gottschalk n’était pas un grand compositeur. Cela est bien évident à tous. Il n’aspirait lui-même en rien à ces sommets Olympiens. Mais il plaisait à la foule et y avait un très grand succès. Au mieux on peut dire que sa musique est intensément individuelle et qu’elle nous communique son feu. Elle possède la spontanéité et le caractère immédiat de l’improvisation alliés à la discipline du piano tel qu’il est joué en Europe, qui lui donne un effet grisant. Gottschalk était l’équivalent d’une vedette de pop music de nos jours et il fit connaître à la plus large audience possible (est-ce qu’un autre artiste avant Paderewski a voyagé autant en Amérique?) les rythmes syncopés de la musique de son pays. Cette promulgation était en elle-même une immense réussite car elle a ouvert la voie à toute une vague de musique que l’on pouvait, pour la première fois, et grâce à Gottschalk, appeler uniquement américaine. Erst einmal dies: Wie ist der Name dieses Amerikaners auszusprechen? Soll die letzte Silbe wie „Schock“ oder „Schalk“ ausgesprochen werden? (Tröstlich, zu wissen, daß sein Publikum die gleichen Schwierigkeiten hatte. 1848 wurden die Leser von La France Musicale angewiesen: „Schließen Sie die Lippen, strecken Sie die Zunge vor, tun sie so, als wollten Sie pfeifen, und schon haben Sie die Lösung.“) Lebensdaten? 1829–1869. Instrument? Das Klavier. Kompositionen? Hauptsächlich kurze Klavierstücke (weit über hundert sind erhalten—eine fast ebenso große Zahl ist verloren gegangen) mit vereinzelten Ausflügen in die Bereiche Oper und Orchestermusik. Genre? Patriotische Fantasien, Operntranskriptionen, Salonstücke und vor allem die ersten Beispiele für die Verwendung kreolischer, lateinamerikanischer und afroamerikanischer Tanzrhythmen in Musikformen europäischer Herkunft. Diese kurzen, zukunftsweisenden Werke—die sowohl Ragtime, als auch (unter anderem) die Werke von Albéniz, Granados und Milhaud um mehr als ein halbes Jahrhundert vorwegnehmen—machten Gottschalk zum ersten wahrhaft amerikanischen Komponisten. Sein familiärer Hintergrund war exotisch. Er wurde als kreolischer Mischling 1829 in New Orleans geboren und war das älteste von sieben Kindern. Moreau (wie ihn seine Familie nannte) wurde nach seinem Großonkel Graf Moreau de l’Islet benannt. Sein Urgroßvater mütterlicherseits, Graf Antoine de Bruslé, hatte unter Ludwig XV. als Befehlshaber der Kavallerie gedient und war zum Gouverneur von Santo Domingo ernannt worden. Die Familie war wegen des Sklavenaufstandes von 1791 von Haiti nach Louisiana geflohen. Seine Mutter, Marie-Aimée de Bruslé, genoß das bequeme Leben der Oberschicht von New Orleans. Sein Vater, Edward Gottschalk, war jüdischer Abstammung, in London geboren und in Deutschland erzogen. Reiselust hatte ihn nach New Orleans geführt, wo er eine erfolgreiche Maklerfirma gründete. Moreau sog die heimische Musik auf wie ein Schwamm und ließ bereits mit drei Jahren, als er Klavier zu spielen begann, deutlich erkennen, daß er ein musikalisches Wunderkind war. Den ersten Unterricht erhielt er von François Letellier, dem Organisten und Chorleiter der Kathedrale St Louis, der ihn mit sieben Jahren für kundig genug hielt, ihn gelegentlich zu vertreten. Auf Anraten Letelliers schickten die Gottschalks ihren 12jährigen Sohn um die halbe Welt, um in Paris, dem Zentrum der musikalischen Welt, zu studieren—was vor 150 Jahren kein leichtes Unterfangen war. Seine Reifung als Pianist vollzog sich schnell, zunächst im kurzen, aber unbefriedigenden Studium bei Charles Hallé, dann im lohnenderen Unterricht bei Charles Stamaty. (Zu seinen Klassenkameraden zählte der siebenjährige Saint-Saëns.) Selbst in einer Stadt, die mit Wunderkindern gesättigt war, machte sich Gottschalk bald einen Namen, wobei seine Zulassung zu den Salons von Paris zweifellos begünstigt wurde durch zwei Tanten, die Comtesse de Lagrange und die Comtesse de Bourjally. Wie dem auch sei, sein eindrucksvolles Aussehen, seine brillante Technik und seine Fähigkeit, zu improvisieren, lösten im Verein mit seinen originellen Kompositionen ungeheure Begeisterung aus, und sein Vorankommen war ebenso leicht wie rasch. Chopin prophezeite, er werde „der König der Pianisten“ werden; Pleyel nannte ihn „den Nachfolger Chopins“; sein Freund Berlioz schrieb: „Gottschalk ist einer der wenigen, die sämtliche verschiedenen Elemente eines vollendeten Pianisten vereinen“, und konnte darüber hinaus 1851 versichern, daß „jeder in Europa inzwischen die Bamboula, Le Bananier, Le Mancenillier, La Savane und zwanzig andere geniale Fantasien kennt, in denen der nonchalante Reiz tropischer Melodik so gefällig unser rastloses und unersättliches Verlangen nach dem Neuartigen stillt“. Diese vier Kompositionen, die tatsächlich Ausschnitte aus Volksweisen und halb erinnerten Balladen aus Gottschalks Kindheit enthielten, stellten den ersten Versuch eines klassisch (d.h. in Europa) ausgebildeten Komponisten und Pianisten dar, Elemente amerikanischer Volksmusik zu nutzen. Als sie erstmals öffentlich dargeboten wurden, war Gottschalk noch keine zwanzig, und wir können uns die Aufregung vorstellen, die sie bei einem Publikum hervorgerufen haben müssen, das eine pianistische Einheitskost aus Sonaten, Etüden und Opernpotpourris gewohnt war. Wenn man seine vier Louisiana-Stücke gehört hat, fällt es schwer, zu glauben, daß sie mehr oder weniger zeitgleich mit Chopins Barcarolle op. 60 und seinen Walzern op. 64 entstanden, mit Schumanns Klaviertrios und Liszts Consolations und Liebesträumen. Die stampfenden Danses créoles von Gottschalk sind Lichtjahre von diesen Kompositionen entfernt, und kein anderer Komponist sollte sich dieser Klangwelt bedienen, bis 1899 Scott Joplins Maple Leaf Rag veröffentlicht wurde. Im Anschluß an Paris machte sich Moreau daran, das übrige Europa zu erobern, was ihm mit spektakulärem Erfolg gelang. Er bereiste 1851 die Schweiz und die französischen Provinzen und versuchte gegen Ende des Jahres sein Glück in Spanien. Hier wurde er der Liebling Königin Isabellas II. (die ihm das katholische Ehrenkreuz verlieh, einen von mehreren Orden, die Gottschalk in liebenswerter Schrulligkeit bei wichtigen Konzerten anlegte). Im Januar 1853 kehrte er als berühmter Mann in die Vereinigten Staaten zurück. Sein Ansehen als Pianist und Komponist war ihm vorausgeeilt, und sein Erfolg bei Frauen—er hat übrigens nie geheiratet—trug nicht eben dazu bei, seine Popularität zu verringern. Sein Freund, der in Manchester geborene Pianist und Komponist Richard Hoffman, schrieb dazu: „Seine Augen waren das auffälligste Merkmal seines Gesichts, groß und dunkel mit eigentümlich schweren Lidern, die immer halb geschlossen waren, wenn er spielte. Es muß in New York heute  einige jugendliche Großmütter geben, die noch den Charme ihrer magnetischen, wenn auch trägen Blicke erlebt haben.“ Gottschalk selbst pflegte sich zu beklagen, daß die jungen Mädchen, die scharenweise seine Konzerte besuchten, ihn ablenken und dazu bringen würden, falsche Noten zu spielen! Was für ein Pianist war er? Allen Aussagen zufolge war er eine jener Naturbegabungen, die nicht viel Übung brauchen, und er nahm keine einzige Unterrichtsstunde mehr, nachdem er sich mit 17 Jahren bei Stamaty verabschiedet hatte. Seine Spezialität waren schnelle, perlende Läufe im oberen Tastenbereich und eine Vorliebe für Figurationen mit wiederholten Noten, sauber und klar ausgeführt und mit rhythmischer, schwungvoller Vitalität. Viele seiner Werke sind keineswegs leicht zu spielen und häufig körperlich anstrengend. Die Musik verlangt eine makellose Technik, einen leichten, zarten Anschlag, der um der wirkungsvollsten Darbietung willen mit Elan, Charme und Joie de vivre einherzugehen hat. Gottschalks Leben in Amerika war von ständigen Konzertreisen bestimmt, von Kuba über Kanada nach Kalifornien. Von 1857 bis 1862 (einer Lebensphase, über die vergleichsweise wenig bekannt ist) hielt er sich hauptsächlich in Südamerika auf, einschließlich der Antillen, Haiti, Puerto Rico, Jamaika, Venezuela, Martinique und Guadeloupe. (Wie gut, fragt man sich, waren an diesen Orten wohl die Klaviere?) Auf Guadeloupe wohnte er an den Hängen des Monte Matouba und führte beinahe ein Einsiedlerleben. Sein einziger Gefährte war ein „armer Irrer, den ich auf einer kleinen Insel kennengelernt und der sich mir angeschlossen hatte … mein Freund, dessen Geistesstörung von der milden, harmlosen Sorte war, bildete sich ein, das größte Genie der Welt zu sein. Mehr noch, er war fest davon überzeugt, ihm sei ein gigantischer, monströser Zahn gewachsen.“ Diese und andere spannende Einzelheiten werden in Gottschalks Tagebuchaufzeichnungen Notes of a Pianist offenbart, die neben denen seines Freundes Berlioz mit Sicherheit die faszinierendsten Musikerjournale des 19. Jahrhunderts sind. Er kehrte erst 1862 nach New York zurück, von wo aus er gleich zu einer weiteren Konzertreise aufbrach, ein hektisches Programm, das er fast dreieinhalb Jahre durchhielt, während der gesamten Dauer des amerikanischen Bürgerkrieges. Als er im Mai 1865 in San Francisco eintraf, errechnete die Zeitung Daily Alta California (mit Hilfe des Pianisten), daß er bis dahin 95.000 Meilen mit der Eisenbahn zurückgelegt und 1100 Konzerte gegeben hatte. Unser Held sah sich jedoch gezwungen, Kalifornien schneller wieder zu verlassen, als ihm lieb sein konnte. Sein Wirken als Schürzenjäger führte diesmal zu abfälligen Zeitungsartikeln, daß die heutige Regenbogenpresse ihre helle Freude daran gehabt hätte: „Gottschalk Verführt Klosterschülerin aus Oakland“, wäre die geeignete Schlagzeile gewesen. Tatsächlich hieß es: „Vagabundierender Musiker … hat den Tod verdient …“ Gottschalk nahm das nächste Schiff nach Südamerika und kehrte, obwohl er schließlich von jedem Verdacht freigesprochen wurde, nie wieder in die USA zurück. Über die letzten drei Jahre seines Lebens gibt es nur lückenhafte Aufzeichnungen. Er scheint hauptsächlich in Peru, Chile und Uruguay gelebt zu haben, wo er im Februar 1868 allein 16 Konzerte in Montevideo gab. Im Mai 1869 traf er in Rio de Janeiro ein. Sechs Monate später brach er-während eines Konzerts zusammen, gerade als er seine Komposition Morte!! spielte. Er starb im Dezember an einer Bauchhöhlenvereiterung. Er war 40 Jahre alt geworden. Sein Leichnam wurde in die USA zurückgeschafft und auf dem Friedhof von Greenwood in Brooklyn beigesetzt. Es fällt allzu leicht, Leute wie Louis Moreau Gottschalk als Gestalten der zweiten Liga mit irgendwie veraltetem Unterhaltungswert abzutun. Gottschalk war keiner der Großen Komponisten. Das ist für jedermann offensichtlich. Er selbst strebte diesen Gipfel des Olymps auch gar nicht an. Er verstand es, einem Massenpublikum zu gefallen, und zwar sehr erfolgreich. Seine Musik ist bestenfalls höchst individuell und temperamentvoll. Sie paart mit berauschendem Effekt die Spontaneität und Unmittelbarkeit der Improvisation mit diszipliniertem europäischem Klavierspiel. Gottschalk war das Äquivalent des heutigen Popstars und lenkte die Aufmerksamkeit einer breiten Öffentlichkeit (welcher Künstler vor Paderewski hat derart weite Teile Amerikas bereist?) auf die synkopierten Rhythmen der Musik seines Heimatlandes. Diese Verbreitung war an sich schon eine monumentale Leistung, denn sie ebnete den Weg für eine regelrechte Musikwelle, die sich—dank Gottschalk—zum ersten Mal wahrhaft amerikanisch nennen durfte.